False-color mosaic of Cumberland Ridge, with superimposed pie charts representing iron-bearing mineralogy. You don't need to know anything about iron geochemistry to know that the stuff represented by the pie charts varies greatly across this scene, which is about 1/3 the size of a football field. Also, the 1.2 m scale bar is the distance between the rover's right and left wheel track. Image from S. Cole, PhD thesis; background image: NASA/JPL/Cornell/Arizona State University; Moessbauer values from Morris et al. 2008 (doi: 10.1029/2008JE003201). While Mars doesn't have much in the way of Earth-like weather, it does evidently share one kind of weird meteorology: acid fog. Planetary scientist Shoshanna Cole has pieced together a compelling story about how acidic vapors may have eaten at the rocks in a 100-acre area on Husband Hill in the Columbia Hills of Gusev Crater on Mars. 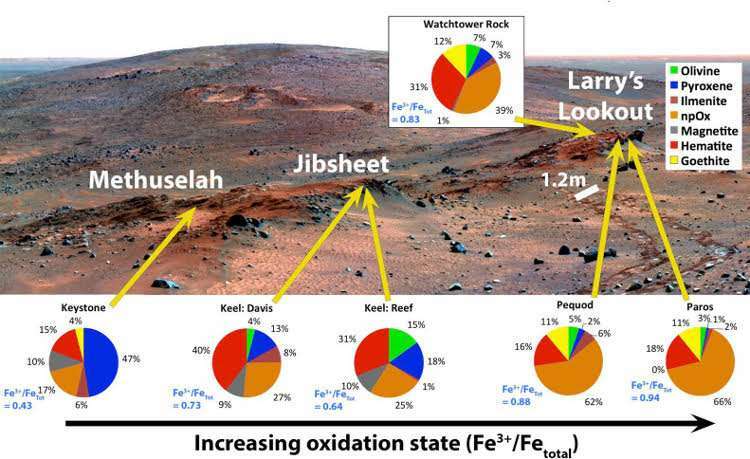 She used a variety of data gathered by multiple instruments on the 2003 Mars Exploration Rover Spirit to tease out information from exposures of the ancient bedrock. She will be presenting her work on Monday, Nov. 2, in Baltimore, Maryland, at the annual meeting of the Geological Society of America. The work focused on the 'Watchtower Class' outcrops on Cumberland Ridge and the Husband Hill summit, said Cole, who is an assistant professor at Ithaca College and began studying the area for her Ph.D. thesis at Cornell University. "The special thing about Watchtower Class is that it's very widespread and we see it in different locations. As far as we can tell, it's part of the ground there," which means that these rocks record environments that existed on Mars billions of years ago. By combining data from previous studies of the area on Mars, Cole saw some intriguing patterns emerge. Spirit examined Watchtower Class rocks at a dozen locations spanning about 200 meters along Cumberland Ridge and the Husband Hill summit. The chemical composition of these rocks, as determined by Spirit's Alpha Proton X-ray Spectrometer (APXS), is the same, but the rocks looked different to all of the other instruments. Across Cumberland Ridge—which is about 1/3 the size of a football field—the Mössbauer Spectrometer showed there was a surprisingly wide range in the proportion of oxidized iron to total iron, as if something had reacted with the iron in these rocks to different degrees. This iron oxidation state ranges from 0.43 to 0.94 across a span of only 30 meters. Meanwhile, data from both the Mössbauer Spectrometer and the Miniature Thermal Emission Spectrometer (Mini-TES) showed that the minerals within the rocks changed and lost their structure, becoming less crystalline and more amorphous. And these trends match the size of small bumps, which Cole calls agglomerations, seen in Pancam and Microscopic Imager pictures of the rocks. "So we can see the agglomerations progress in size from west to east and the iron changes in the same way," Cole said. "It was super cool." But the fact that the rocks were otherwise the same in composition indicates that they were originally identical. "That makes us think that they were made of the same stuff when they started out. Then something happened to make them different from each other." Cole hypothesizes that the rocks were exposed to acidic water vapor from volcanic eruptions, similar to the corrosive volcanic smog, or "vog," that poses health hazards in Hawaii from the eruptions of Kilauea. When the Martian vog landed on the surface of the rocks it dissolved some minerals, forming a gel. Then the water evaporated, leaving behind a cementing agent that resulted in the agglomerations. "So nothing is being added or taken away, but it was changed," Cole said. "This would have happened in tiny amounts over a very long time. There's even one place where you see the cementing agent healing a fracture. It's pretty awesome. I was pretty happy when I found that one." More support of this idea comes from a 2004 study in which scientists conducted laboratory experiments exposing mock martian basalt rocks (based on data from the Mars Pathfinder mini-rover) to sulfuric and hydrochloric acids. The results indicated that as these rocks are exposed to acids, they lose their crystalline structure—just like what Cole sees in varying degrees across the Watchtower Class exposures. As for why there is a trend in the iron and the degree to which the rocks were changed, the answer is microclimates, similar to those in different areas of your home garden. The time that the gel was present on the rocks depended on how much sunshine and wind the rocks got. The more altered rocks, which have larger agglomerations, are on very steep slopes facing away from the Sun, which makes them shadier. The least altered rocks are on sunnier and gentler slopes, according to Cole. 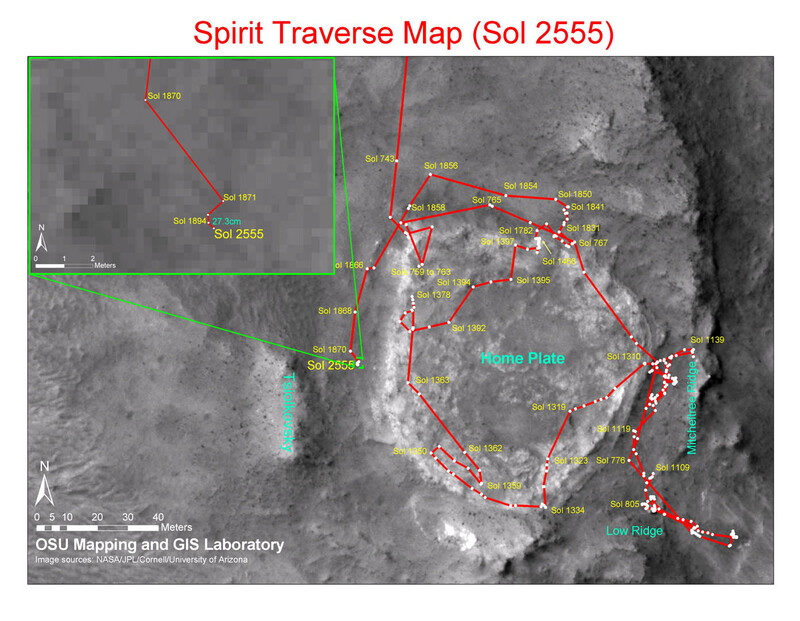 Piecing together this Martian vog puzzle underscores the story of Spirit's success. "Spirit's the rover who always had to try harder," she said. "She was sent to Gusev Crater to look for lake deposits, but landed in lava field. She had to make a long trek to the Columbia Hills to find evidence of ancient watery environments. There's still tons of data to analyze there, and that's really nifty." If you're a competent scientist don't talk like a child. And I thought EU nutters couldn't get dumber. You Vietvet thought? That's remarkable. I believe the magnitude of the events that have modified all planet or moon surfaces is greatly underestimated by mainstream science. A flare/cme may have a magnitude millions of times greater than anything ever witnessed by modern man, and would have the ability to push aside any magnetosphere, if present, and greatly modify the surface. That planets/moons are affected by the even the mild space weather we presently experience is not in doubt, but the current model places no limits on the amount of magnetic energy that may be injected into a solar flux tube. when all the evidence points to A, why continue to insist X is the cause? Since when is an acidic fog a plasma? The last paragraph is telling. The writing about plasmas and discharges is speculation, informed speculation, but speculation never the less. I'm just a bit over Vietvets' negativity and in particular his personal attacks. YES ... I know I'm also intolerant sometimes. It seems that Vietvet and I have been standing on the edge of a fight in the gutter for a while. It's possible that some ideas relating to plasma in astrophysics are worthy of more research. If only he could give someme leeway in exploring the bleeding edges of scientific endeavour then perhaps I might be amenable to more productive interaction. I'm not suggesting that pseudo-scientific diatribes are of any value, mostly it's annoying nonsense. 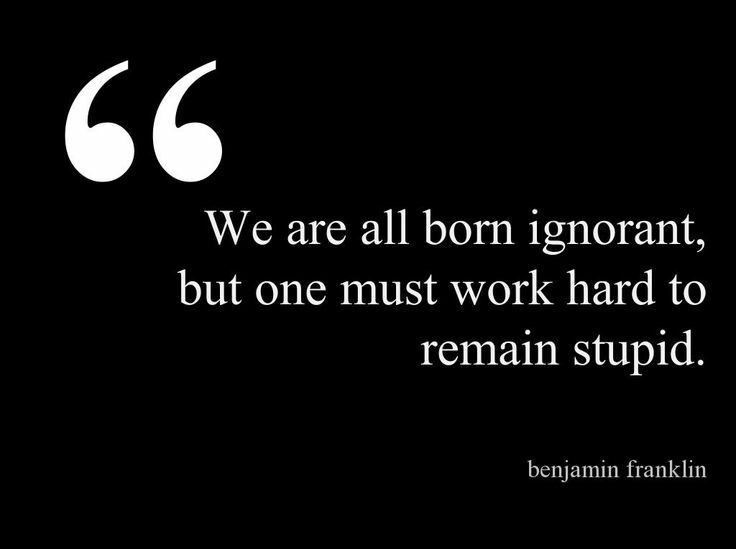 Just that there's some, seemingly difficult to substantiate, ideas 'out there' that deserve not to be dismissed without due consideration. So, thanks Captain for reminding me to step back from the edge. In the meanwhile, how far away were/are these (extinct) volcanoes that caused the vog? I'll piss off now and take some medication. Irish Coffee. Custard Danish with sliced Almonds. why wouldn't i like intellectual discourse? especially when you have a valid point? your danish sounds good... have an extra one for me! you can look all around the area with that map and there are some major points labeled for your searching pleasure, although i didn't find home plate etc on the map labeled. and take the time to switch views from visible to infrared too! how far away were/are these (extinct) volcanoes that caused the vog? They have to write for the average American, who cannot read beyond the level of a child. "2- there is no evidence that it HAS happened either"
I have evidence that says it DID happen. Do I have proof? No, but if I can conduct the correct experiments, I MAY be able to scientifically show that there have been cataclysmic events of an electrical/plasma nature, from a flare/CME that has decimated most of Earths surface too,and not billions of years ago either. I'm looking for specific magnetic signatures in selected geographic areas, maybe these guys can help. The evidence is physical, hold in your hand real. Proving that it was created by electrical forces is the next stage, but my own magnetic measurements seem to confirm it. The next stage is to confer with those with more specialised equipment. I am not proposing any mechanism that has not been demonstrated in experiments or used in existing industrial or commercial processes. That such mechanisms have not been considered to be involved with any aspect of geomorphology is a weakness in the standard model and needs to be addressed, and will be.